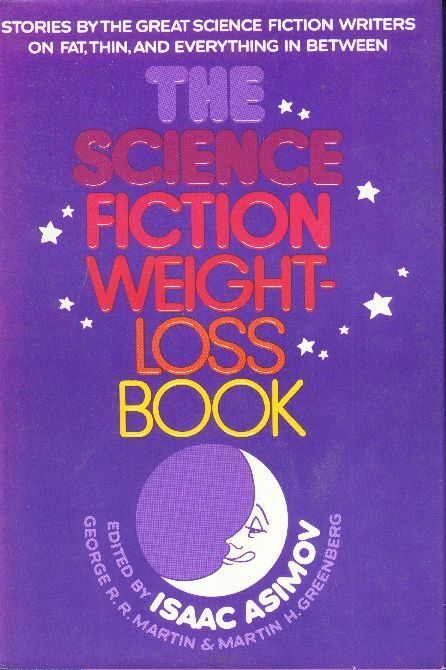 In The Science Fiction Weight-Loss Book, editors Isaac Asimov, George R.R. Martin, and Martin H. Greenberg have constructed a unique collection of stories by great science fiction writers, having to do with weight, diet, obesity, slimness, and everything in between. The best-selling Isaac Asimov leads off with his introduction, “Fat!” Stories follow by Frederik Pohl, Robert Silverberg, Orson Scott Card, H. G. Wells, Kit Reed, and Jack Vance, among others. From John Anthony West’s chilling story “Gladys’s Gregory,” in which a young wife struggles to fatten up her reluctant husband, to Stephen King’s chilling “Quitters, Inc.,” about the ultimate technique for curing bad habits, the stories offer a fascinating array of characters faced with the problems posed by obsession with weight. Whether you are fat or thin, gluttunous or abstemious, if you like good writing by masterful science fiction writers, you want to read these fifteen great stories chosen and annotated [sic!] by Isaac Asimov, George R.R. Martin, and Martin H. Greenberg. Unfortunately, Asimov himself is not represented (”Good Taste” is about the only story he wrote that could squeeze in, and even that would be a bit of a stretch), so although I would recommend it to the general sf fan who wanted to relax for an afternoon, it has less interest for the Asimov fan.